Were you expecting to be on the battlefield? Get back in the rear, Sauron. 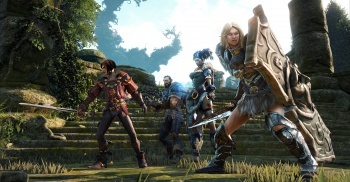 Fable Legends pits legendary heroes against less-than legendary villains, both of which can be controlled by players. But if you were expecting your villain to go toe-to-toe with the good guys, forget it; your true villain has other people do the dirty work, says Lionhead. This Xbox One exclusive is set in the Age of Heroes, with four human, or AI, players attempting to complete a quest while the villain, again human or AI, puts a stop to their pesky interference. But the villain doesn't physically manifest on the battlefield. Instead, the villain gets to control the monsters, pitting the most powerful creatures at its disposal against the oh-so-dashing heroes. SmartGlass control is doable, but not essential, and it's even possible for a villain to play via SmartGlass in the same room as the hero player. Still no launch date for Fable Legends.